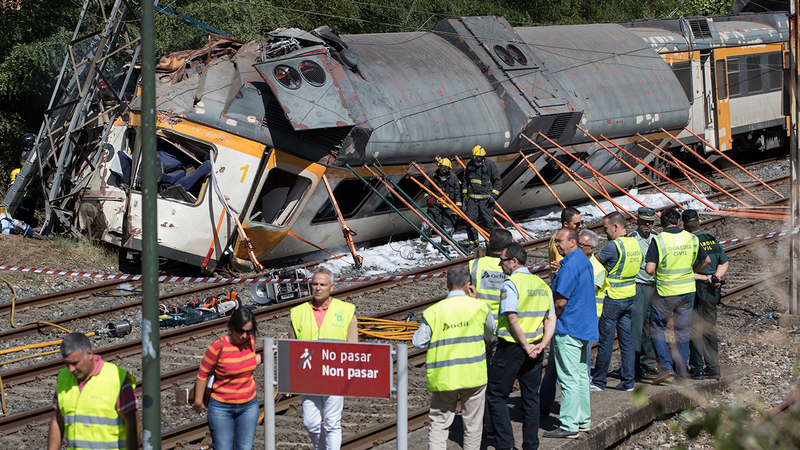 MADRID, Spain -- A passenger train derailed Friday in Spain's northwestern Galicia region, killing four people and injuring 47 others who were taken to hospitals, authorities said. The Galician regional government said the accident occurred at 9:30 a.m. (0730 GMT) in Porrino, about 450 kilometers (280 miles) northwest of Madrid. It said emergency services dispatched doctors on helicopters to the scene. The train was traveling from Vigo to Porto, in neighboring Portugal. It belonged to Portuguese rail company Comboios de Portugal. Adif railway infrastructure company said it has opened an investigation. The derailment occurred on a straight stretch close to Porrino station. Spanish media said the train was carrying around 60 passengers. The train had three cars. The front one came completely off the track and hit a post next to the line, leaving it leaning to one side. The back two cars were partly off the tracks.